This favorite rice dish is made in the oven. 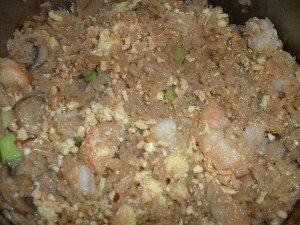 The rice requires a lot of ingredients but it is well worth the effort. Combine the shrimp shells, the whole scallion, the ½ inch piece of ginger, the two garlic clove halves, the jalapeno pepper halves, and a teaspoon of sea salt in a stockpot with a lid. Add six and ½ cups of cold water. Cover the pot. Put the pot on low heat and bring the contents up to a simmer. When the stock begins to simmer, let it cook for thirty minutes. Strain the liquid well through a colander and set it aside. Add the sesame oil and the canola oil to an ovenproof pot with a lid. Put the pot on medium high heat for four minutes. Sprinkle the shrimp with sea salt and black pepper. Add the shrimp to the pot and cook the shrimp while stirring for two minutes. Turn the heat off. Remove the shrimp and cut the shrimp in half. Set the shrimp aside. Into the same oil that the shrimp was cooked in, add a tablespoon of chopped scallion, the chopped ginger, the minced garlic cloves, and the chopped jalapeno pepper. Cook on medium heat for three minutes while stirring frequently. Add the broccoli and the mushroom slices. Cook while stirring for an additional four minutes. Add the soy sauce and the oyster sauce. Cook while stirring for one more minute. Add the rice. Stir so that all of the rice grains get coated with the soy sauce. Add the shrimp stock. Stir one more time. Bring the mixture to a boil. Cover the pot and place it in the preheated oven. Let the rice cook for about 30 minutes until all of the shrimp stock gets absorbed by the rice. The rice should be tender but a little firm to the bite. 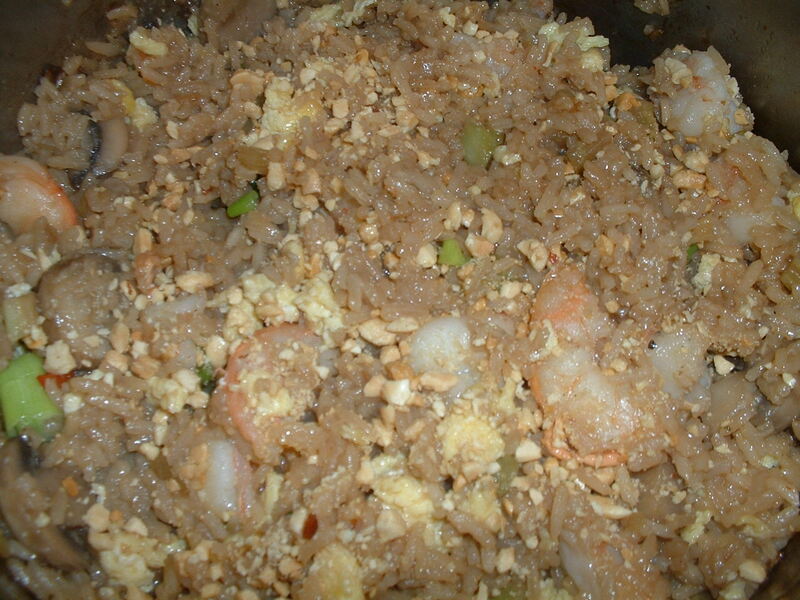 To finish the rice, add the scrambled eggs, the reserved shrimp, the peanuts, and 1/3 cup of chopped scallion. Stir well and serve. Combine the chili powder, the lime zest, the sea salt, the ground cumin, and the red cayenne pepper in a bowl. Mix well. Brush the salmon fillets (on the flesh side) equally with the canola oil. Spread the chili powder mixture evenly on the flesh side of the salmon fillets. Refrigerate the salmon fillets for at least an hour before cooking. Soak the cedar plank in water for at least one hour. Let an outdoor grill get hot on medium heat. 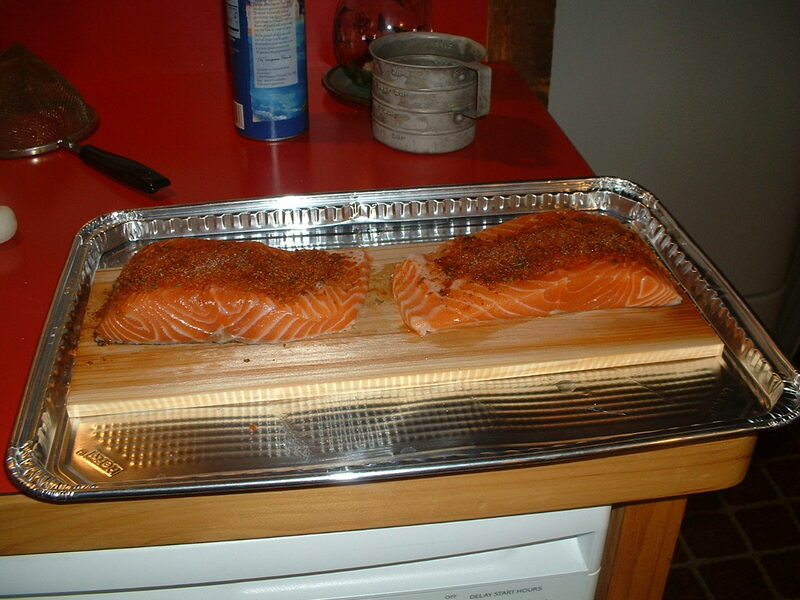 Place the cedar plank on the cooking grate. When the plank begins to smoke a little, place the salmon fillets on top of the cedar plank skin side down. Close the lid of your grill. 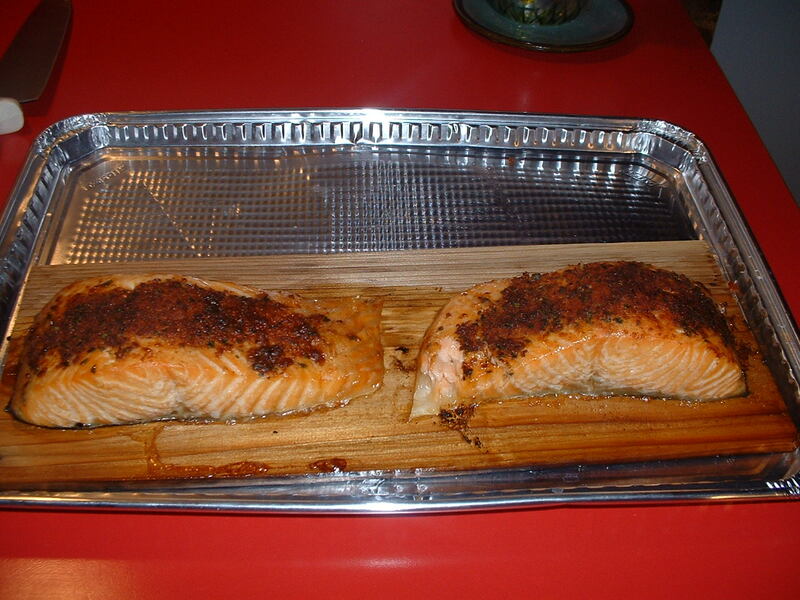 Let the salmon fillets cook for a half hour without taking the lid off. The fish is ready when it begins to flake easily with a fork. Serve while hot. I had leftover pesto in my refrigerator and decided to use it to bring more flavor to otherwise bland ground turkey. Slice the Roma tomato in half lengthwise. Brush the tomato halves with a teaspoon of olive oil. Sprinkle the tomato halves with a pinch of sea salt and a pinch of ground black pepper. Place the tomato halves on a baking sheet. Roast in the preheated oven for 45 minutes. Combine the roasted tomato halves (with the pan juices), the basil leaves, the garlic clove, ½ teaspoon of sea salt, a ¼ teaspoon of ground black pepper, and a tablespoon of olive oil in a food processor. Pulse until smooth. Taste and add more sea salt and/or black pepper, if desired. Combine the ground turkey, the pesto, two teaspoons of sea salt, ¼ teaspoon of ground black pepper, the garlic powder, the onion powder, the grated cheese, the bread crumbs, the red cayenne pepper, and the beaten egg in a mixing bowl. Mix well. Form the meat mixture into six equal patties. 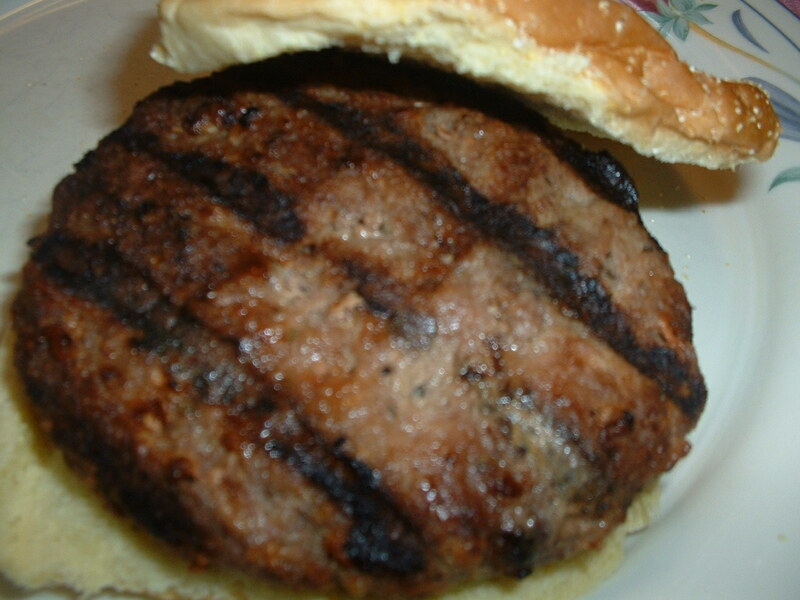 Cook the patties on a hot gas or charcoal grill for 10-12 minutes until the juices run clear turning only once. Cut the peppers in half lengthwise. Seed the peppers creating “boats” for the filling. In a mixing bowl, combine the cream cheese, the garlic, the scallions, the cumin, the sea salt, the red cayenne pepper, the chili powder, the cheddar cheese, and the Monterey jack cheese. Stir until well blended. Taste and add more sea salt and/or red cayenne pepper, if desired. Spoon the filling into the hollowed out peppers. Coat a baking sheet lightly with cooking spray. 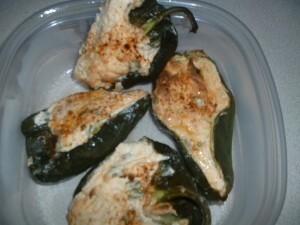 Arrange the filled peppers on the baking sheet. Roast until the peppers are tender and crisp with the filling slightly browned. This should take about 30 minutes. Let stand for ten minutes before serving.